Nugget Hops was released in 1982 by the U.S.D.A and is a cross between Brewers Gold and a high alpha acid male. Nugget Hops is the mother of Millenium Hops and ranks second for amount grown Oregon and by 1991 had taken over 14.1% of U.S. hop production. Nugget Hops has an acute bitterness from its 9.5%-14.0% alpha acid content. It provides the umph in many beer styles that require the hop jolt including imperial style ales. It is a dual use hops that has green, herbal aroma, has a relatively low co-humulone oil content. The myrcene oils are on the high side, which helps provide some of the woody tones. Nugget is an extremely popular hops for brewing. It was bred partly for its storage capacity, and holds 70%-80% of its alpha acid content after 6 months storage at 20 degrees celsius. The moderately long compact cones are harvested mid-season. Nugget is moderately resistant to the plagues of the region including Prunus Necrotic Ring-Spot Virus, Downy Mildew, and Powdery Mildew. 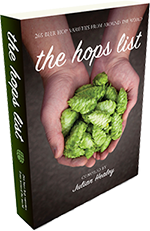 The Hops List official eBook is ad-free and puts every beer hop right on your iPad or Kindle. 265 beer hop varieties, descriptors, analytical data plus an invaluable selection of brilliant insights from brewmaster's at some of the world's most prestigious craft breweries. On receiving your plants remove the plants from the bag, check to see if they are moist, if they are not place in a bucket of water for 1 hour, then plant it in your garden. 1. Dig a hole 9 – 12 inches deep. 2. Place the plant in the hole with the crown of the plant, the bit with the shoots on, 2-3 inches below surface level. 3. Cover all the roots and crown with good quality well mulched soil, or John Innes No3 compost. 5. Sprinkle some general fertiliser around the surface. 6. Water in only if the soil is dry. 7. Plants should be spaced about a metre apart. Hops can grow on a wide range of soil types, although in general they grow best on deep well drained non-acid loam’s. Good soil moisture and fertility are essential in order to sustain the prodigious aerial growth of the hop plant each year. Bines usually begin to grow from the underground rootstock in early April. These healthy bines of appropriate vigour are selected for a procedure known as ‘training’ are induced to begin climbing the strings, which they do in a clockwise direction. When 2-3 bines are established on a string, all surplus shoots should be removed, usually completed by the end of May. Hop plants have to be provided with supports for the climbing bines on which the cone bearing lateral shoots are formed. Hops can be grown up strings, poles or on a fence with wire support. Fertility can be improved with farmyard manure or proprietary brands of general fertiliser such as growmore. Hops are susceptible to mildews, aphids and red spider. These can be controlled with various garden sprays available from most Garden centres. Pick the hops off the bines in early to mid September. 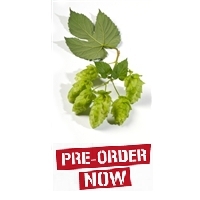 Drying should take place immediately after harvesting, this can be achieved with very satisfactory results by placing the hop cones in an airing cupboard. Store in a dry place. These can be used for brewing your own beer or Hop pillows (only a small amount put in your pillow will help you sleep). If required for floral decoration do not remove hops from bine, but cut the whole bine off in September and hang to dry in a warm airy place. Remove all leaves off bine before drying. In the Spring, select the number of shoots required, max 8 per plant, and remove all surplus. Remove all growth above ground any time between late Autumn / Winter.This will help reduce carry over of pests and diseases. © Copyright 2015 A Plus Hops. All Rights Reserved.